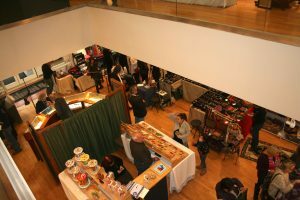 The 54th Holiday Fine Art & Craft Fair at the Art League of Long Island presents an eclectic variety of one-of-a-kind art and craft work created by 70 exhibitors at their art center in Dix Hills. The fair takes place December 2 and 3, 2017 from 10am to 5pm in the Art League’s galleries and studios. The fair is juried, so prizes will be awarded to participating artists and craftspeople with the most innovative designs. Plan to spend time at the fair, enjoy the art on display, see live art demos, join in on a hands-on art activity, listen to live music, and grab a bite to eat from the gourmet food truck. Admission to the fair is free as are the demos, music, and art activity. The Art League of Long Island is a not-for-profit visual arts center, so tax-deductible donations are much appreciated! The Art League’s center is located at 107 East Deer Park Road in Dix Hills, just off exit 42N of the Northern State Parkway, and about 2 miles north of exit 51 off the LIE. For more information, please call (631) 462-5400 or visit www.artleagueli.org.